← A Gift of Comfort! I was going through a few TWEETs the other day and read about a new nail trend that instantly captured my attention. It’s completely a must have for me!!! I must admit I have never become excited of devouring a plate of small fish eggs although Caviar is associated with luxury, and opulence. Set to be released next month, a British nail brand will deliver a DIY nail kit to the US that is guaranteed to make you feel a sense luxury and high class! The finished effect gives nails an instant sophisticated look. Britain has introduced a new manicure trend called the “Caviar Mani” which uses beads to create a 3D effect on the most simple of manicures. The Caviar Mani is simple to do yourself just sprinkle small beads over your favorite wet nail polish and let air dry for at least 15-20 mins. Apply a top coat for extra hold and flaunt. 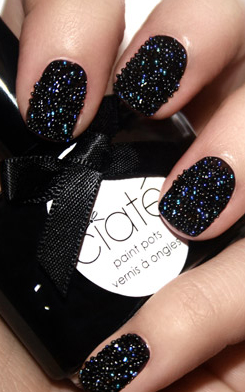 If you aren’t up for trying it on your own, UK nail polish company Ciate will launch kits exclusively to Sephora soon. The inspiration behind the Caviar Manicure™ came about when Charlotte, Ciaté’s Creative Director, was looking to create 3-dimensional nails for a front cover magazine shoot and wanted to develop something feminine, indulgent yet delicately extravagant. This entry was posted in DIY and tagged 3D Manicure, black pearls, bridal, Caviar manicure, ciate, fleur de force, mother of pearl, Nail Art, Peep Fleur de Force's, rainbow, trendy nails. Bookmark the permalink. Wow! very trendy…I know it will look great on someone..just not me. Love reading what’s new ! I’m always on the lookout for the newest, flyest trends. Love this! Waiting for the kit to hit the shelf! 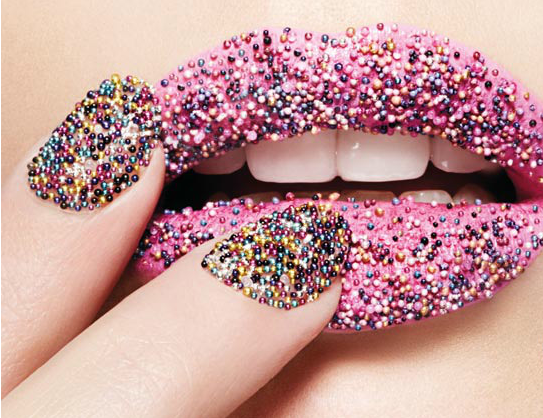 I am very excited about the caviar manicure! I love beads and beading and the effect created by this manicure is exquisite! Can’t wait!